During the week of February 9th, Dr. Michael Salla posted a number of interesting links on his Twitter page. These posts were on the subject of the planned partial disclosure by the Cabal which we have heard so much about. 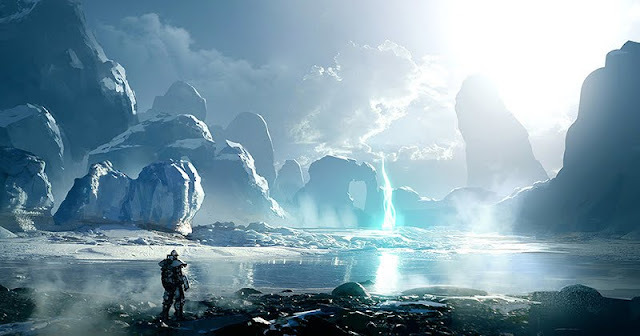 This partial disclosure would involve the tactic of using the Antarctic excavation and discoveries to dazzle the public in such a way that would allow the Cabal to escape justice. Their hope is that when their crimes of pedophilia, a century of global extortion, financial fraud, societal manipulation, and mass murder all come to the surface, we will all be too amazed to care. The Twitter posts on Dr. Salla's page reference the fact that the corporate media is already on site in Antarctica claiming that they are reporting on climate change and the melting of the ice sheet. However, as we have heard, the situation may be much more interesting. Here are Dr. Salla's posts from February 9th through the 11th. 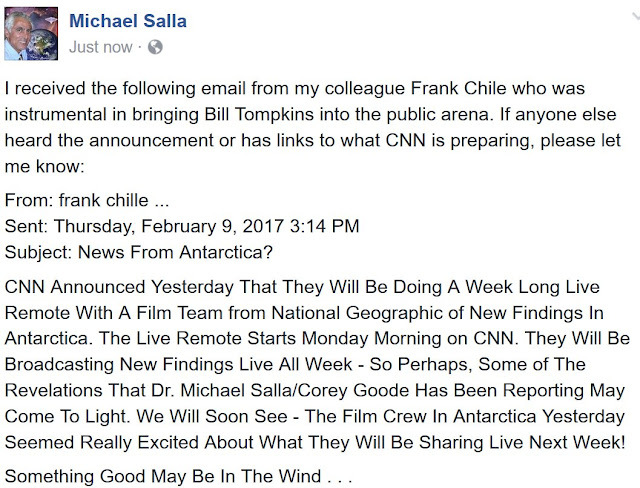 CNN to report on Antarctica Discoveries Next Week? Update on CNN and Antarctica special. These reveal quite an interesting story of the possible plans of the Cabal in their efforts to escape judgement. To add to these posts, here is CBS with their own explanation of their presence in the Antarctic. For those who are familiar with the Gaia series Wisdom Teachings with David Wilcock, there were a number of episodes which covered the last instance when the Cabal attempted a number of similar partial disclosures. This occurred during the year 2015 in tandem with NASA's Dawn mission to the planetoid Ceres. 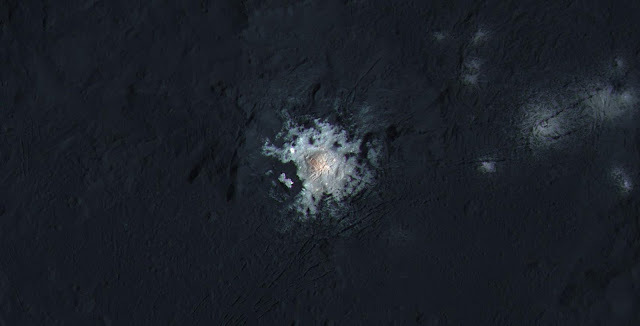 During this mission, the people of the world were exposed to multiple images of the luminous spots on Ceres' surface. These disclosures gradually showed us images of higher and higher resolution, and eventually showed a close-up image of what looked like artificially built, geometric structures. Whether these images were true to life or not, it was clear that the images were intended to send the message that the structures were built by intelligent hands. Below is a short excerpt from an article on the Ceres revelations from Wisdom Teachings (article from the Washington Post included). Here is an excerpt from the Washington Post on the Ceres spot and the Dawn Mission which recorded the data. If we are familiar with past soft disclosure initiated by the Cabal, we may recognize the possible tactics they may attempt to apply during the Antarctic disclosure. Back in 2015 there were a number of soft disclosures promoted by NASA and the mainstream media on a variety of truths about space and life on other planets. Many of these disclosures seemed to parallel the material we have heard from the series, Cosmic Disclosure on Gaia.com, which made these revelations particularly interesting to see. The fact that these disclosures were coming through mainstream media in such a consistent and yet subtle way, was most curious aspect about them. The revelations also gave an extra amount of corroboration to the testimony of Corey Goode. As the story progressed, it became clear that certain interests behind the scenes were aware that time was short, and that if they wanted to achieve their partial disclosure, they had better act quickly. It also seemed that these Cabal interests were aware that Goode was spilling all of their secrets to thousands of people. The succession of events was fairly amazing to look back upon, considering how far events have presently progressed. The interesting part about these soft disclosures was the fact of how they were organized. As things turned out, the entire setup for the whole partial disclosure narrative was in place and ready to go, just in case the Cabal needed to play their hand. As we have heard, the Cabal intends to use their partial disclosure to distract the public from realizing the truth of their own crimes against humanity. This was the case back in 2015 and it seems to be the case at present. Antarctica seems to be the centerpiece of this second attempt at partial disclosure. We can even see the unfoldment of these events taking place by the plans to report on site by CNN and CBS. Just as in 2015, the Cabal seems to be setting things up so that if they need to they can initiate their diversion. However, I do not see this being successful. There are too many of us awake to fall for any partial disclosure. We are too vocal, too visible, and most of us are too stubborn to let the biggest criminals of the world get away with a century's worth of genocide. The truth is coming, and from what I have seen from my fellow truth-seekers, we don't intend to accept anything less than the entire truth.